Because Japanese ATMs tend to differ slightly from cash points found in North America and Europe, we have put together this guide to help you figure out your withdraws, deposits and everything in between. Luckily enough, the acronym ATM is common parlence in Japanese. However, some banks call ATMs "cash corners" (kyasshu konaa キャッシュコナー) or "cash point" (kyasshu pointo キャッシュポイント). JP Bank ATMs almost universally accept overseas cards, so if you need to get money from home, finding a post office is a safe bet. Shinsei also accept non-Japanese cards but they are in the minority amongst the big banks. Most ATMs utilize touch screens and some even have biometric scanners for finger prints. At the top of the ATM there are two slots, a large one to the right for the "pass book" (tsucho 通帳) and a small one to the left for cards. Below are two doors, the larger one (on the right in this case) is for bills and the smaller one is for change. Note that not all ATMs collect and dispense change. Some ATMs offer a variety of services such as signing up for insurance, getting a cash advance, and so on but for the sake of simplicity we will just explore the most basic functions. Update Pass Book (tsucho kinyu 通帳記入)- you open up your bank pass books and insert it into the ATM. The ATM will then proceed to print out all your transactions itemized by date. Generally speaking, pass book updates can only be done at bank owned ATMs. Withdraw (hiki-dashi 引き出し)- again, self explanatory. Many bank ATMs allow you to withdraw in increments as small as 1 yen. 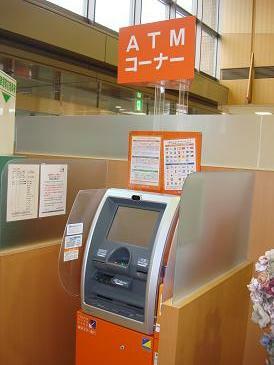 Deposit (azukari-ire 預かり入れ)- many banks allow you to deposit coins as well as bills. If you use a bank-owned ATM, you can use either your pass book or your bank card to access your account. Finally, JP Bank, 7-11, and big city banks often have English menus (usually with only limited functionality) but smaller banks and older ATMs don't. If you are using a foreign bank card, you will usually be limited to withdraws only. Warning: Many ATMs close at night. With the exception of a few large bank branches in big cities and newer foreigner friendly banks like Shinsei Bank, 24 hour bank-owned ATMs are a rare sight. Banking hours differ substantially by location and institution. For ATMs in small post offices, opening at 9:00AM and closing at 4:30-5:30 PM on the weekday is the norm. Many only carry limited hours on weekends and holidays (usually 12:30 PM closing time on Saturdays) and many close entirely on Sunday. Big central post offices (chuou yubinkyoku 中央郵便局) tend to keep later hours (9:00 - 7:00-9:00). If you can read limited Japanese, use this website to search for JP Bank business hours. For the most part, JP Bank doesn't charge for withdraws and deposits if you use their in-network ATMs. Other bank ATMs keep widely varying hours, although most are open during the weekends (charging fees for withdrawals and deposits at certain times). Usually the weekday (heijtsu 平日) and weekend/holiday (do, nichi shukujitsu 土・日祝日) hours are listed clearly on the door. Many bank ATMs are interoperable but, again, out of network usage will incur fees. Most convenience store ATMs have charts with times and fees listed on them. Some banks have special deals with major convenience store chains wherein the charge reduced fees or no fee at all provided you meet their conditions. Furthermore, depending on the bank, convenience store, and network, even "24 hour" ATMs may have a withdraw and deposit cut off time (usually around midnight). 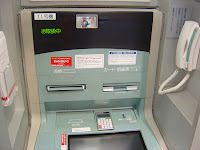 Most ATMs are connected to both of the two major banking networks, yu-cho (JP Bank) or MICS (Multi Integrated Cash Service, an alliance of national and local banking groups). However, make sure to double check since some banks like Shinsei, Mizuho Corporate, and so on don't participate in the MICS system. Finally, many banking systems shut down during the New Years holiday season for a period of about 3 days, starting from January 1st. This includes bank-owned and 3rd party ATMs. So if you need money, make sure to plan ahead. Check back soon for more info about one of the most important features in the Japanese banking world: the electronic bank transfer.